The ShowBoats International Boys & Girls Clubs Rendezvous took place 21-24 November, 2013, and was a huge success, raising millions of dollars for charity. ShowBoats International magazine, part of Boat International Media, is North America's premier luxury yacht publication. It’s hard to top a 25th anniversary party, but this year’s ShowBoats International Boys & Girls Clubs Rendezvous just may have managed it if you’re measuring in fun quotients. A favorite charity event of the superyacht community, the rendezvous began on Cat Cay in the Bahamas 26 years ago. It was held in South Florida for a long time, then last year—for the big 25th—moved to the mega resort of Atlantis on Paradise Island, Bahamas. It was such a success that the organizers decided to continue the party there this year. Co-chaired by Steve Mariano, who brought yacht Outta Touch, and Mike Busacca of Fraser Yachts with fiancée Jessica Chavez, the three-day event included a yacht hop, a Hot Havana Nights party and a gala headlined with entertainment by Kool & the Gang and a special performance by comedian Dennis Miller. The organizers are still adding it up, but indications are they met their target figure of $1.4 million, thanks to the attendees’ generosity, which included six new members to the Admirals Club (members who give an annual donation of $50,000). All of it goes to running the 12 Boys & Girls Clubs of Broward County, Florida, which currently serves 12,752 at–risk youth, with more than half its members from families below the poverty line. Savannah Ashton, the Broward Clubs 2013 Youth of the Year, was at the gala to share her experience. The high school sophomore came to the Club nearly a decade ago when both her parents were out of work. At the time, her only Christmas presents were the ones provided by the Club, and the staff became her mentors, helping her with her homework in a positive, enriching environment. She is currently at the top of her class at school, aspiring to attend university and law school, and mentors the Clubs’ younger members, volunteering 520 hours in the last two years alone. She is also a talented musician who wowed the gala attendees with her amazing voice. While the number of yachts at the rendezvous at 11 wasn’t as high as last year, some attendees like designer Claudette Bonville said this year was the most fun. The scavenger hunt was a riot with 12 teams scurrying all over the resort to accomplish dozens of seemingly impossible tasks. Add in a Bloody Mary contest, a slots tournament, cruises on Zeelander and Van Dutch boats and a blackjack lesson and there wasn’t a dull moment. But in the end, as Claudette pointed out, catching up with friends was the most fun. 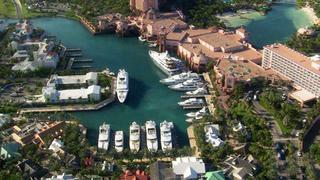 It is the close-knit yachting community that truly made the rendezvous successful.